I remember how overwhelming and confusing the homestudy and dossier requirements were with our first adoption. I think I e-mailed our agency or social worker daily with questions. I found a lot of support online from adoption friends in my DTC group as well. I can see the light at the end of the tunnel on that part of the process in our current adoption and it was all so much easier this time around. I thought I would share some tips for those of you who are starting out. Make sure you have access to a copier (with ink refills) and scanner. Have a designated area to organize all of your paperwork. 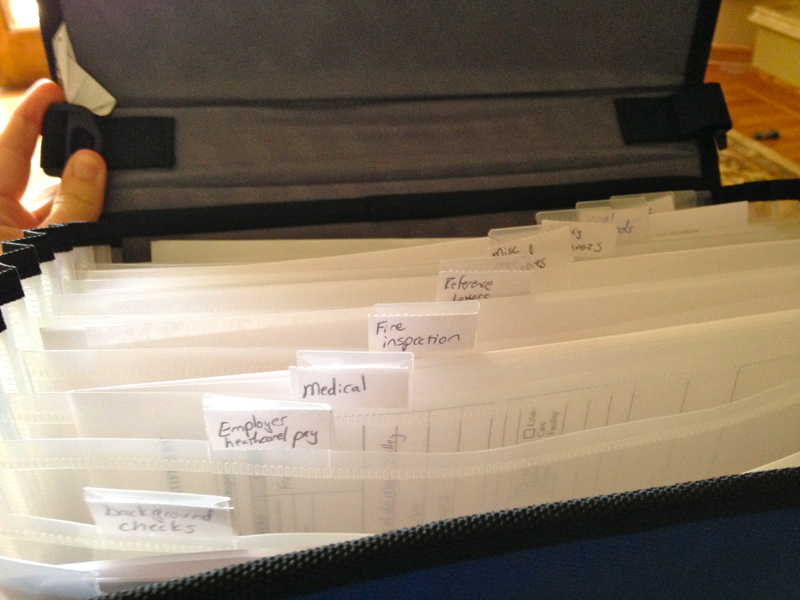 I used an accordion folder and I switch out the tab labels when I switch from gathering homestudy papers to gathering dossier papers. Other people prefer a binder with tabs and folders, or a box with hanging files. Keep all of your adoption related receipts in a designated location to prepare for filing the adoption tax credit or employer adoption benefits. There were a lot of audits when the tax credit was refundable. This is less of an issue now that it is not refundable, but it is best to be prepared. Find a notary. You’re going to be seeing him or her a lot so preferably one you won’t have to pay for services. Check your local bank or see if your employer has one on staff. Using the same notary each time can make the certification/authentication process a little bit easier in the future, but is not required. Decide how you are going to organize all of your e-mails from your agency, social worker, USCIS officer, courier, etc., so that you can find what you need easily. If you have a smart phone, you might find an app such as Tiny Scan, which allows you to turn photos into .pdf files to be useful. Consider how you are going to transfer sensitive information. Most people attach files such as copies of their tax returns or medical records to e-mail but e-mail is not actually very secure. Consider using a platform such as Dropbox to transfer this information to your social worker or agency. Get a Fed-Ex account (or your preferred carrier) and learn how to use it. You will be mailing a lot of important documents back and forth. You will want to be able to provide pre-paid mailers to people such as your social worker or USCIS officer and be able to track the shipping. The next thing you need to decide is where to start. The requirements for the dossier are the same for everyone but what you will need for your homestudy will vary by state. 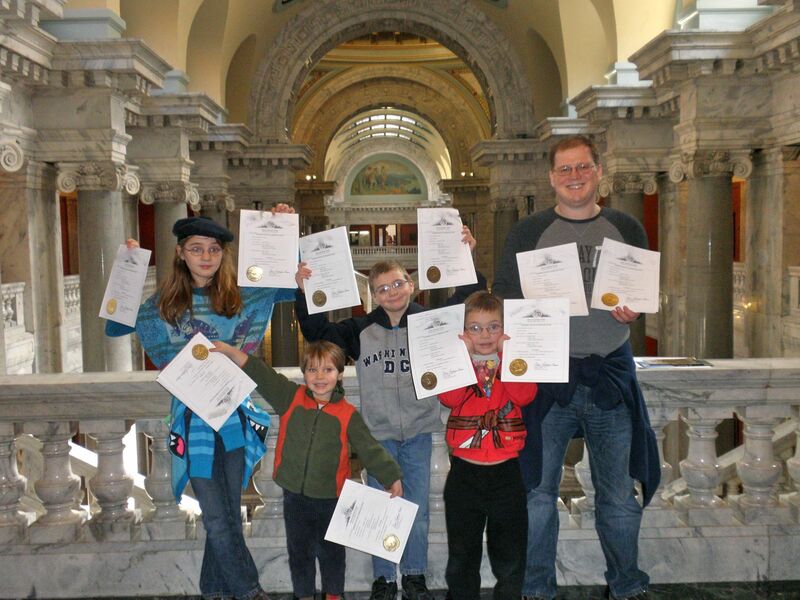 During our first adoption, I lived in a state which was low regulation but required county certification of documents. This adoption we live in a state which is high regulation but no county certification requirement. On our first visit, my social worker handed me a list of over 36 items we would need to provide! It was quite daunting and much of it seemed like bureaucratic redundancies. So, how do you decide where to start? Background checks can take a long time and you will need them for every state you have ever lived. Make those a priority, especially if you have moved around a lot. Here is a link with all of the state request contact info. If you or your spouse doesn’t have a passport, apply for one now. A copy of your passport is necessary for the dossier, so don’t think you can wait until closer to travel. If it takes a while to get into your doctor, be sure to schedule your physicals early. Some doctors may not complete the forms while you are there, but say that they have up to 14 business days to complete them for you. Similarly, if you need an outside inspection such as a fire inspection or well testing, do this sooner rather than later in case scheduling or waiting for results is a problem. Get your references lined up. Some people really procrastinate writing the letters. If you will need one from a teacher (required by China if you have a school aged child), try to get that done before summer vacation. Some agencies will let you ask an extracurricular instructor such as a music teacher, scout leader, etc. Using the same references for both homestudy and dossier will make things easier, so try to find people that will satisfy everyone’s requirements. They can print and sign two copies of the same letter. One goes to your social worker and the other to yourself for the dossier. Don’t wait too long to work on the personal essay questions that you will need for the homestudy. They usually aren’t the sort of thing people can write out in an hour, and some people find them emotionally exhausting to work on for long periods of time. You should try to think ahead when your social worker is preparing your homestudy. It is very common for people to have their homestudy written for a girl with minor needs under the age of two. And then they decide to be open to a boy, or fall in love with a 4 year old girl, or decide to add a second child. Any changes to your homestudy will involve getting a homestudy update and filing a supplement with USCIS, costing you hundreds of dollars. You do not want to be out all of this money because you are approved only for “under two” and you accepted a referral who was 2 years and 2 months old. Have your social worker write your homestudy as open-ended as possible. Be approved for either gender, two children, and as old as your social worker is comfortable with. This costs you nothing and makes no commitment on your part. Remember that if you are unsure of a requirement you should check with your social worker or agency first rather than asking the internet. You can have 20 different people telling you whether they were required to have a fire inspection of their home, get their well tested, or take the entire family for TB tests and physicals, but it still won’t tell you if your particular state or agency has that requirement. Be sure you have the most up to date information and forms. During our first adoption one of our background checks was held up because I had sent an outdated form. Rather than informing us that the form was no longer used, the agency just tossed it in the trash. If we had called sooner to check on the hold up we could have had the new form in the mail much sooner. During this adoption, I asked an adoption friend in my new state if county certification was required and she said it was. It turned out the state recently changed their requirement so that county certification is no longer required. For your physical you will likely need to use separate forms for China and your state so make sure you have them both on hand. Bring extra copies in case the doctor does not fill the form out correctly the first time. The China physical form will need to be notarized and this is a big problem for people if there is no notary on staff. Some agencies will let you have a copy of the form notarized and send that to China instead. While China clearly accepts that, other agencies will not allow you to do it. Instead, ask if the doctor could have the form notarized by the hospital notary when he or she is doing hospital rounds. If all else fails, you will have to try to find a traveling notary. You will need multiple copies of “passport style photos” which can be expensive. Some people have had success taking their own passport photos at home. Try http://www.epassportphoto.com/. Other people find it to be tricky to get no shadows and everything lined up in the correct proportions, so another option is to pay for one professional passport photo, scan it, and use 123passportphoto.com to print six copies of it onto a 4×6 photo. You will need to make several copies of all of your dossier paperwork. One to keep for yourself, one for the Chinese consulate/embassy during the authentication process, and one to send with your dossier to your agency. 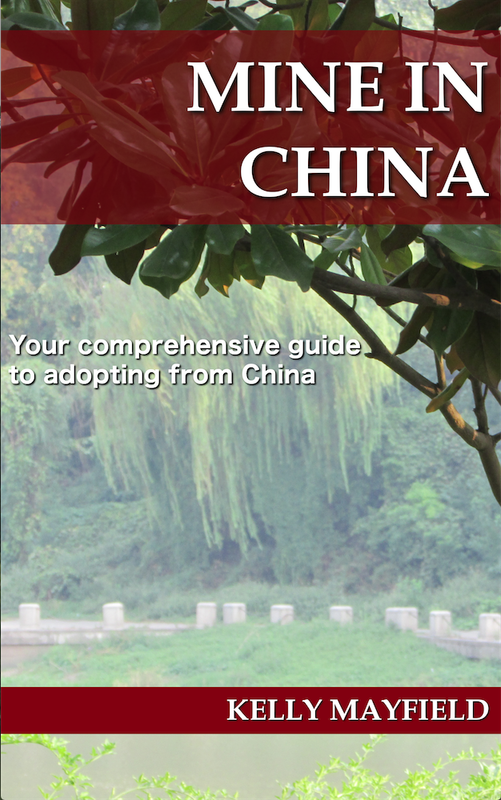 Since our first adoption was completed, a digital copy of everything is now required by China. It is a common mistake to leave this step until last. Not only is this a significant amount of labor to do all at once, but you cannot remove any of the staples, grommets, or fasteners which office place during the certification and authentication process. Chinese consulates have refused to authenticate documents which have stray staple holes. Waiting until all of these items are attached to begin making copies will require you to develop some serious ninja origami folding skills. You should be provided with multiple copies of the homestudy. You can NOT remove the staples on the one you will have authenticated. Remove the staple from your personal copy to make two additional copies, then you can re-staple it. As you accumulate the documents, make three copies and a scan, keeping the copies all separated in different folders or whatever your preferred method is before starting the certification/authentication process. After you add a certification page, make the copies and scan of the certification before moving on to the next authentication step. NOTE: If only one spouse is traveling to China then you will need an authenticated power of attorney to finalize the adoption. Have that ready early so you can send it through the authentication process with the rest of your documents to save on courier and postage fees. After your homestudy is complete and you have compiled all of the documents needed for your dossier, you will need to have them certified and authenticated. Some agencies do this for you, some do not, and some will for a fee. My agency is one which offers it as a service for a $500 fee and people often ask in my agency group if it is worth the cost. Half the people will reply that it is totally worth it for peace of mind knowing that it was done correctly. The other half (I’m in this camp) say it really isn’t that difficult so you might as well save yourself the money for some other part of the adoption. Like all the mailing, courier, and authentication fees you’re getting ready to pay! Doing this yourself can also save a lot of time. We are an east coast family with a west coast agency. I had the county and state authentications done in two days, which would have taken my agency a substantially longer amount of time with all of the mailing back and forth. MAKE COPIES OF YOUR DOCUMENTS FIRST. If you are in one of the handful of states which requires county certification, you will need to figure out which county every notary is from. This is one reason I suggested you try to use the same notary as much as possible. Then call up the county secretary office and ask what you need to do to get notarized documents county certified, how much it will cost, and what forms of payment they accept. Drive or mail your documents according to the instructions you received. I had documents from three different counties our first adoption. It was kind of interesting that the more rural county used a computer system to look up the notaries’ commission info while in the largest county with the biggest government the worker looked the info up in an enormous old fashioned ledger. MAKE COPIES OF THE COUNTY CERTIFICATION SHEETS. After county certification (or start here for most people), contact your state secretary of state office and ask what you need to do to get notarized documents state certified, how much it will cost, and what forms of payment they accept. Often they will do this while you wait if you come in person but take up to two weeks if you do it by mail. Make it very clear to the state secretary people that you do not want an apostille. China does not accept the apostille so you want a “great seal” instead. 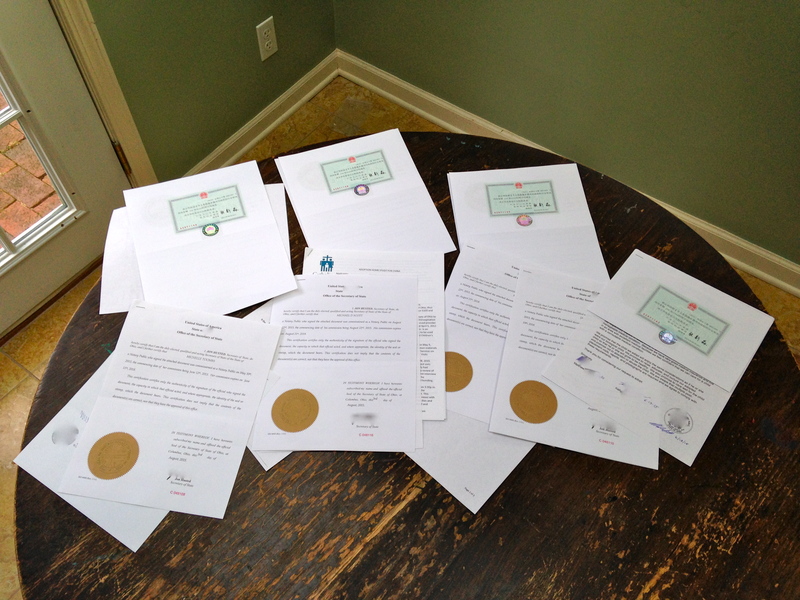 If you are certifying by mail, it is not unusual to receive the documents back with an apostille which will cause you to have to send them through a second time. If you make your request by mail use lots of capital letters and bolding to make it clear YOU DO NOT WANT THE APOSTILLE!!! MAKE COPIES OF THE STATE CERTIFICATION SHEETS. Figure out which Chinese Consulate jurisdiction you are located. If you have documents from multiple states, then you can send them all through the Embassy in DC. However, those who use the Embassy will need to first send documents through the US Department of State for authentication, which will add on more time and money. Be aware that the requirements vary by consulate. Check in advance with a courier to make sure the wording your notaries have used is acceptable to your consulate. Chicago has a reputation for being the pickiest and recently has stated that they will no longer authenticate any notarized copies other than the I800a. Anyone can use the Embassy in DC, so consider that as an alternative if you cannot get your dossier documents through your consulate. The Embassy will take longer and be more expensive, but it might be worth it to avoid redoing multiple documents. When you receive your envelope full of completely certified and authenticated documents, do a happy dance and rejoice that you have survived this part of the process. Then MAKE COPIES OF THE AUTHENTICATION SHEETS!! You mail a notarized copy of your homestudy to a lockbox in Texas with the required forms, documents, and money. The package is opened, you are assigned a receipt date. If you filled out the form for electronic notification, you’ll get a text letting you know it was received. They then mail all the documents to Kansas. Don’t ask. About a week after your package is received, you will receive a letter in the mail notifying you of a date for FBI fingerprinting. You will have no input on the date or time. It is usually 1 to 3 weeks away. At some point, you will either receive a Request for Further Evidence (RFE) or approval. A RFE will always delay your approval time. Sometimes officers will be nice enough to e-mail you their request when they generate the letter for mailing. That allows you to send the information before the RFE shows up in your mailbox. The approval is sent by regular postal service, so I recommend including a prepaid mailer when you send in the initial application. With our first adoption we lived 4 hours away from the office and it took TEN DAYS for our letter of approval to arrive. The officer may choose not to use the mailer, but most will do so and you will have a trackable shorter wait. Notarize a copy of the approval, have it certified and authenticated, then you have a complete dossier to be sent to China! When you send in your i800a application read all of the instructions carefully, both those on the USCIS site and any your agency may provide. Be sure to include ALL of the supporting information which is required. It can be quite extensive. Failing to send even one piece of paper will get you an RFE (request for evidence) which will set you back two weeks because what you send in response to the request will have to be sent through the lockbox again. People particularly have trouble with Page 9 which you leave blank unless someone else filled in the application for you. YES send in the blank page! The final piece of paper that you will need for your dossier is your immigration approval (i800a). Some people are not sure if they should wait for the immigration approval to have all of their documents authenticated at the same time, or to send them in batches. If you have documents which are approaching 6 months since the notarization date then you should authenticate them without delay so you don’t have to redo the document. I chose to have everything authenticated while waiting for the i800a for both of our adoptions. My agency is one which will review the dossier in advance. This gives me enough time so that if they determine one of the documents needs to be redone, I can fix it and send the corrected document through the authentication process with the i800a. Not all agencies will review the dossier in advance, so check with your agency. I have found that couriers have different pricing structures. Often one will be cheaper for sending a large amount of documents and a different one is cheaper for sending one or two documents. If you are authenticating in batches, then check the pricing on more than one courier. One part of this process which people have a lot of questions about is whether or not walking in to an FBI office to get fingerprinted early will expedite the process. When we adopted the first time, this was a common practice. Not all offices allowed it, but if you were able to do so then it seemed to get an earlier approval. At that time, you were assigned an officer with your receipt date. However in immigration, like any office, some officers are more productive than others. If you were assigned to an officer who got through a lot of files, they would probably make time to get you approved if you had let them know that you were already fingerprinted. If you were assigned to an officer who did not get through files as quickly, your file might languish on their desk. In fact, you might get fingerprinted on the same day as someone else and hear that the someone else got approved that very day by their officer. But when you called your officer you kept being told to try back next week. Every week. Until you eventually learned that the officer went on vacation without approving your file. Ask me how I know this. Anyway, at some point in 2013 immigration seems to have changed the way the files were processed, presumably to try and fix this discrepancy in timelines. The current process is that the files are kept in order by receipt date. When an officer is ready to work on a new file, they assigned new files in receipt date order. Usually approval is on the same day it is assigned, but sometimes within a day or two. This means that the files are approved strictly in order of receipt date. Walking in for early fingerprinted will not speed up your process any because you file is not assigned to an officer until later in the process, after the point which you would have been fingerprinted at your appointment time. The exception to this would be if you have an officially expedited case, such as adopting a child who is aging out. How long will it take from the time you have a receipt date until your i800a is approved? The good news is that while immigration can take up to 90 days, it is rarely that long. Wait times vary greatly depending on how many applications are received at a time and how many immigration officers are on hand. Around holidays or before school starts officers like to take vacation time, just like at any other office. Average times are somewhere between 40 and 60 days. Someone at the now defunct China Adopt Talk Forum used to keep track of current times. 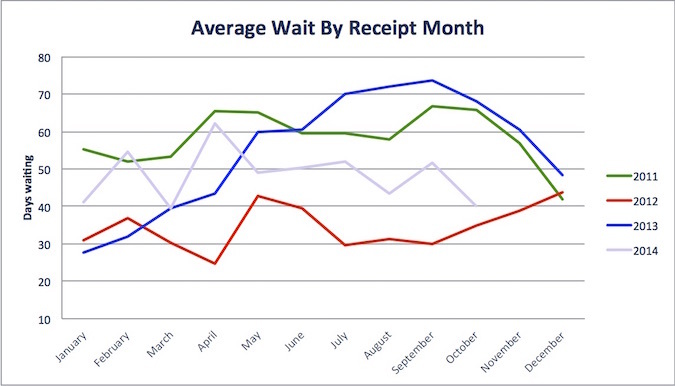 Although this chart is not current, it will give you an idea of how approval times can rapidly fluctuate. 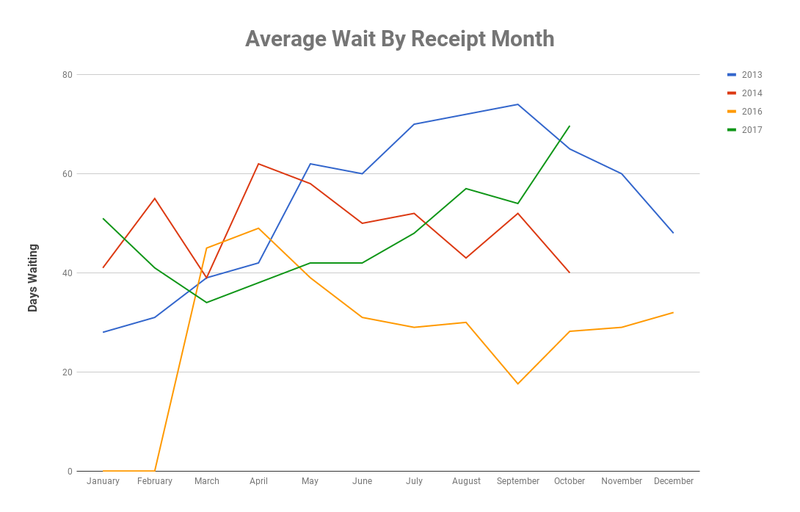 Samantha D’Aprile Abel, who keeps the current approval time chart in the China Adoption Questions Facebook group, made this chart for me to show more recent approval times. There is a gap in data from October 2014 in the China Adopt Talk Forum dates to February 2016 when she began keeping track on Facebook. Once you have completed your homestudy and assembled your dossier, you have finished the most labor intensive part of the adoption process. Sending that dossier off to China is a huge milestone! Most of the rest of the process involves waiting for various government agencies to issue a piece of paper, so you can send it to a different agency so they can issue a different piece of paper. The second half of the process is more trying in many ways, because waiting for other people to do work doesn’t keep you nearly as occupied as the first part. But hang in there, you will get to the end of the waiting eventually! This entry was posted in Uncategorized and tagged Adoption Resources on August 20, 2015 by minefam.